When Julien Rosefeldt’s installation piece Manifesto, made in collaboration with Cate Blanchett, made its US premier in New York at the Park Avenue Armory, it was the kind of immersive, sensory teasing experience that is in the best of art. More than that, it was aware of its pretentions: Blanchett dressed up as a dozen different “characters” -- from an austere mother at Thanksgiving to a newscaster sporting cerulean blue blazer and deep red hair, to a punk ready to smear her eyeliner – and delivering manifestos from (mostly male) artists, politicians, theorists, architects, dancers, filmmakers, etc. is profoundly of the video art world. There’s no narrative, and, on its surface, little to connect one character to the other, never mind their various manifestos, concentrations and hybrids of the work of Marx, Tzara, Vertov, von Trier, and on. But walking around from one large screen to the next, Blanchett’s sculpted face projected to be large and sometimes fearsome, the affectedness, and commitment, to making each character sound and look different while being juxtaposed at the inherently didactic nature of her “lines”, it was amazing to view and incredibly silly. It could even be read as camp, challenging and subverting narrative and filmic norms, toying with them to give them an edge and pointed quality. Listen to a school teacher earnestly explain the “Dogme 95” manifesto to her students, or a CEO talk about abstract expressionism at a private function. It’s heightened, a little winky. How could you turn this, where each manifesto is about ten minutes long, into a 90 minute film when it’s essentially designed in antithesis to that format? Part of the joke of Manifesto is that each “scene” is a scenario in which a very broad, skeletal “narrative” is present, or rather the parodic facsimile of one. Blanchett’s voiceover takes over, and then is passed on to whatever character she’s playing. It’s the joke of a movie scene, complete with gorgeous establishing shots and flowing camera movement, formally everything your favorite art house director would do, but raising its middle finger to the application of form and content. In its transition from installation to film, the manifestos have been truncated, the order remixed slightly, but, most noticeably, Rosefeldt has chosen to structure the film rarely having one manifesto finish in completion. Instead, he jumps to another manifesto, and at some point, after some circling about, he returns to one of the original scenes that began but never finished. Unfortunately, this attempt to have the scenes – excuse me, manifestos – in dialogue with one another doesn’t quite work. On the one hand, since almost all of the manifestos delivered are distillations, concentrations, remixes, simulacra, and meldings of several different manifestos from a given movement, snipping them up and trying to get the ideas to talk with one another, in a different way than the installation already provided, feel clunky and lacks cohesiveness. Messing with the editing and the fluidity of the videos ultimately makes it less fun. Perhaps crucial to the enjoyment of Manifesto, as it originally was presented, is how silly it is. 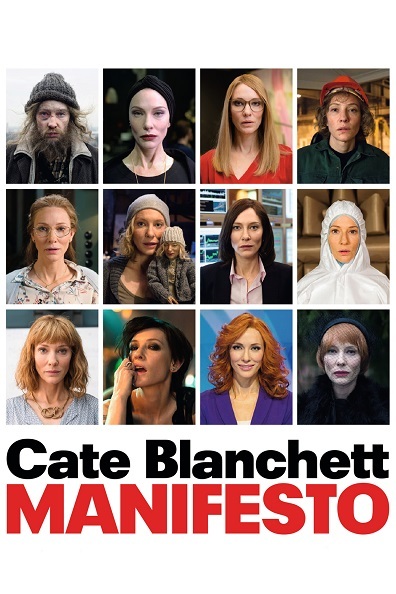 It’s not that Manifesto is insincere when it wants its manifestos – its thinkers and characters – to engage with one another (then again, “Art requires truth, not sincerity”) but the editing, ironically, transforms Manifesto into the ponderous piece of experimentation that it ostensibly is parodying and critiquing. The piece is flattened, dull, its new theatrical context swallowing it whole. Being in the space of seeing it live felt sharper, funnier, and more dialectical with the audience. Since Manifesto was turned into a film, which premiered at the 2017 Sundance Film Festival, one’s enjoyment is predicated how much one enjoys Cate Blanchett. She’s a masterclass of straddling a line of earnestness and irony, and it’s fun watching her transform into a dozen different people in different settings and backgrounds, class statuses, jobs, and relationships to other people. She can be sarcastic, or breathy, or assertive, or ferocious. Blanchett is one of the most talented actresses working, and her ability to make these experimental figures into people just short of three dimensionality is a testament to her skill. So, it’s a shame that, as a feature, it’s edited to make her, and the project itself, less interesting. There was both an ironic and sincere energy to Manifesto viewed as individual videos in succession of one another (which you can do on Julian Rosefeldt’s website), reveling in a bit of fun and in the strange poetry of the texts. The chorus of voices that marks the end of the film is more significant when it fills sand enormous room, like the texts talking to one another over the heads of viewers. But Rosefeldt’s feature version feels a little staler, the energy of the fuse at the beginning of the film, wisped away, the aspects that made the art piece work flattened or discarded due to the format change and editing. But Blanchett is still fairly interesting, still mesmerizing to watch on the screen. I’m more than happy to listen to her tell me that “nothing is original”. Even if it means she’s pointing out this film’s flaws.